The BA Summer Show kicked off this year with a prize Graduating BA Fine Art student Andrew Hart was celebrating both the opening of his degree show and being the recipient of a £2,000 award from charitable organisation The Honorable Society of the Knights of the Round Table. Formed in London in 1720 by a group of actors, artists and literary friends (one notable early member was Charles Dickens!) to keep the values of King Arthur alive, today the society offers exciting opportunities to young people and awards grants to those who have made an exceptional start to their career. 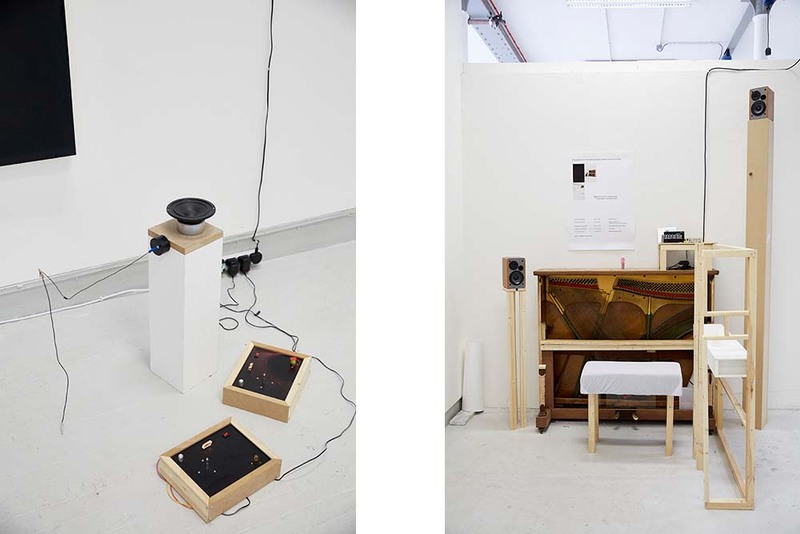 Andrew was selected as the winner of this award for his degree show installation It Happened in a Blues Dance/Inversions in Bass, comprising painting, sounds, installation, found objects and performance. We spoke to Andrew about his work, what winning the award means to him and his plans for the summer and beyond. Installation as part of Andrew Hart’s BA Summer Show 2017. Photograph by Kristy Noble. How does it feel to win the award? What impact do you think this will have on your work? Firstly being nominated was such a surprise as we have a myriad of good artists in our year. Being nominated alongside artists whose works I have admired for a long time was a good moment for my art. To win came as shock, yet it really made me realise what I was doing was appreciated and even enjoyed. The award will and has already given me more confidence in my practice and will help support my further studies at MA level. Tell us about the process of putting your final project together. Throughout the course I have played and experimented in various ways with the different practices in Fine Art, with an eye on trying to layer these practices to create a expanded painting experience. You can see elements of this ebbing through my works from the first year and in the second year with the ongoing tutoring and critical dialogue I began the process of trying to push this further and sound became more prevalant in my installations. During this time I also started a collaboration with a graduate of Chelsea, Janek Nixon, and we began performing live together. The painting element of my work has always been an ongoing dialogue around the formal nature of painting. The installation took 2/3 months to come up with but the main spark was the finding/buying of an upright piano from an Interior and Spatial Design student at Chelsea – the preparing of the piano was a fun 6 month process of hand-sanding and modernising the piano using it as a performative object. Ongoing discussions with my personal tutor Martin Newth and other members of the staff team and peers helped to develop the idea. How you would describe your practice generally? Multi-disciplinary based in painting. I work with the formal language of painting and use it as a playful starting point to critique and research contemporary issues ranging from identity to environmental issues caused by the onslaught of the digital age – and everything else in-between. Where are you from and what are your interests? Do they have connections to the work you make? I’m North west London born-and-bred and my parents are from Barbados. I think that the language I use in my painting and practice is borne out of my experiences of living in London, the colloquial nature of city living are elements that my work looks at. Are there any artists/practitioners you are particularly influenced by/interested in? I realise that a lot of my references may seem a bit old school but these artists are my sustenance: Chris Ofili, Frank Bowling, John Hoyland, Hurvin Anderson, Albert Irvine, Haroon Mirza, Helen Frankenthaler. I also really like my fellow students Maia Regis, Eva Kralic and Tim Tokley, Billy Bagilhole, Helen Stephenson and Serena Huang – also The Triptych (Billy Fraser, Mimi Hope and Tom Ribot). There are many more on my year but I’m not sure I can fit them all into this writing! 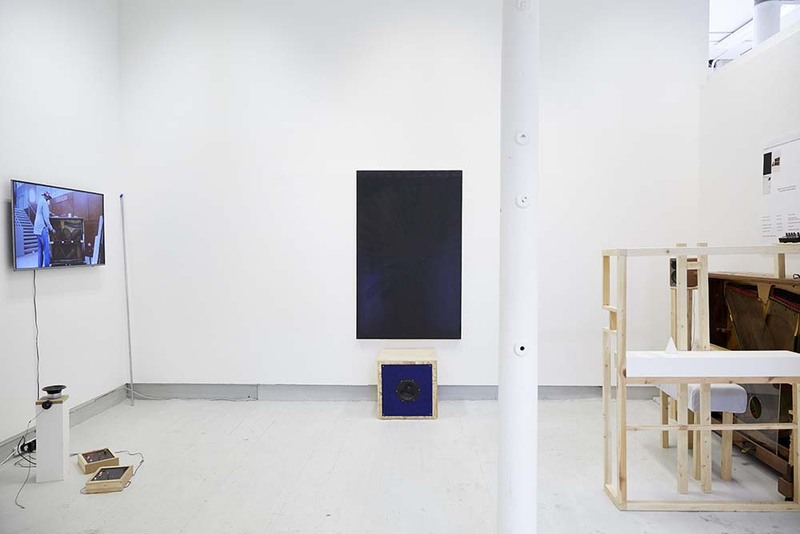 Installation views of Andrew Hart’s BA Summer Show 2017. Photographs by Kristy Noble. What do you hope to go on to do after graduation? Any plans for the summer and beyond? Fortunately I will be continuing my studies – with the help of the award. I will be studying MA Painting at The Royal College of Art starting in October. During the Summer I will be doing an experimental residency called Graduate Pop or Peace in it Together Bit by Bit 3, a curatorial project I have been doing since the first year. For this, I will spend the month of August at a new gallery in Whitechapel called Yamamoto Keiko Rochaix Gallery, where the wonderful lady Keiko asked if I wanted try something there and the relaxed conversation lead to a residency. I will make work, invite some recent graduates from my year – MA and other recent BA Chelsea students that I find interesting – to have quick pop-up shows. I will also make some site-specific works using materials found in the local area and I will also collaborate with fellow student Serena Huang in our ongoing collaborative project Hart and Huang pt 5. There will also be a sound event. It is all very exciting, fast-moving and a reopening of the Chelsea cross-course dialogue. Please tell us more about the events you are planning and how people can get involved. Everyone is welcome – free entry, free vibes, free conversation – running through August at Keiko Yamamoto Rochaix, 19 Goulston Street, Whitechapel, London E1 7TP. Events invites will be on the UAL website and FB keep an eye out!